But there are other cooling effects which are exploited in refrigeration technologies, notably the effect of evaporation & pressure changes in fluids. What happens to every drop of water that evaporates from your water tumbler? How much energy could that drop contain? 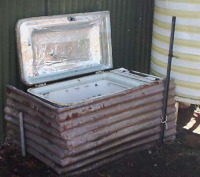 Instructions on how to build and use an Evaporative Cooler Fridge, Zeer Pots and Radiant Fridges (solar ovens used for cooling, or even making ice, at night). Prehistoric refrigerator called a Zeer Pot Fridge. Cool your food or drinks with no electric needed. This DIY project uses a red clay pot and sand to cool the contents inside from evaporation. Evaporator coolers work great and they are very easy to make. This Zeer pot might have been what the ancients used to keep their produce fresh in the summer seasons to last longer. I think this could be very handy if we were to loose power..
A charcoal cooler uses the principal of evaporative cooling to maintain a cool interior temperature for refrigeration and food preservation. The device is constructed from an open timber frame with charcoal filled sides, which is kept continually moist. As warm, dry air flows through the moist charcoal, water is evaporated into the air and it is cooled. With detailed information and building instructions for different types of root cellars, ice houses made with pykrete, and other vegetable storage structures (outdoor barrel storage pit, storage straw mound, etc.). Why is an aerosol can cold? Today I want to talk about passive cooling strategies for keeping your home cool in hot climates. This is a very hot climate and yet our earthbag roundhouse is about 15 degrees Fahrenheit cooler inside than out. So 15 degrees Fahrenheit, 8 degrees Celsius temperature difference with no mechanical cooling systems. Basic solar science can be used to keep your home cool without electric bills. Zero Energy Design® has been doing it for decades. An evaporative cooler (also swamp cooler, desert cooler, and wet air cooler) is a device that cools air through the evaporation of water. Evaporative cooling differs from typical air conditioning systems which use vapor-compression or absorption refrigeration cycles. Evaporative cooling works by employing water's large enthalpy of vaporization. The temperature of dry air can be dropped significantly through the phase transition of liquid water to water vapor (evaporation), which can cool air using much less energy than refrigeration. In extremely dry climates, evaporative cooling of air has the added benefit of conditioning the air with more moisture for the comfort of building occupants. Unlike closed-cycle refrigeration, evaporative cooling requires a water source, and must continually consume water to operate. Information about stack ventilation, Bernoulli's principle and designing for both in buildings (to increase cooling by air flow), and also about solar chimneys. Information about different ways to use solar chimneys & wind catchers for cooling in hot places. A windcatcher is a traditional Persian architectural element to create natural ventilation in buildings. The windcatcher can function in three ways: directing airflow downward using direct wind entry, directing airflow upwards using a wind-assisted temperature gradient, or directing airflow upwards using a solar-assisted temperature gradient. (information about solar chimneys, which are mainly used to create airflow & cool buildings, and some science that can be used minimize solar heat collection and maximize air flows). (as many cooling systems use water, which specially needs to be harvested & stored efficiently in hot & dry climates).